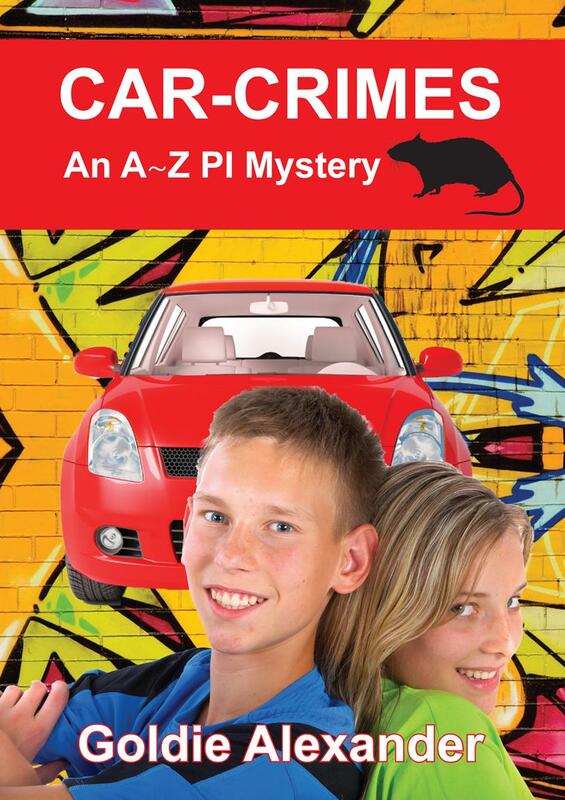 CAR-CRIMES: AN A~Z PI MYSTERY. Taylor Ferrini,a Year 9 Grevillea College student and the fourth member of the ‘Zoo’ gang, is accused of stealing luxury car insignias from Shortland Mall multi-story car-park and injuring a security guard. When Anna and Zach, the A~ZPIs, are asked to help prove his innocence, they are chased by the scary Emo gang, Anna is kidnapped by the terrifying Radman twins and the kids are constantly in trouble. Some obvious suspects include the CEO of Shortland Mall, the owners of ‘Degustions’ restaurant and ‘Flame’ nightclub’, Bro Radman who needs help to get his art into a prestigious gallery, plus those local shopkeepers who resent the mall taking away too many of their customers.Old friends from Book 1 rookie-journalist Brett, amateur wrestler Ruby and Zach’s pet rat M - help the A~Z’s PIs nail the real culprits down. Zach’s added distractions includes caring for all his animals including mothering the baby possum Joey, and all that homework.